Carrie Mae Weems, Missing Link: Despair, 2003. Charles Briton, Gorilla, 1873. Costume design from Mistick Krewe of Comus’ 1873 “Missing Links” parade. Today, contemporary artists like Carrie Mae Weems have begun to explore some of the many Mardi Gras traditions rooted in the post-Civil War fallout. In several elements of her installation, The Louisiana Project, Weems explores the legacy of antebellum race and gender dynamics, including those specifically related to Mardi Gras. 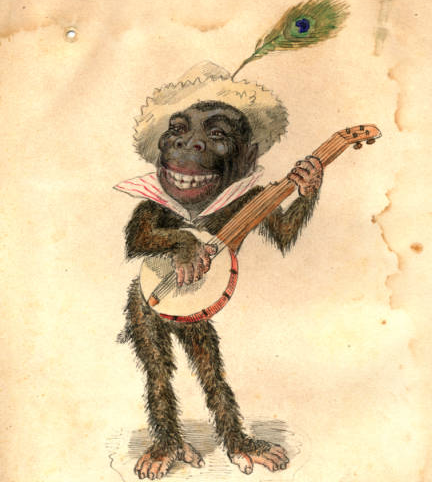 In a powerful photograph entitled Missing Link: Despair, Weems tackles the racism tied to early costume designs such as Gorilla from the 1873 “Missing Links” Comus parade. 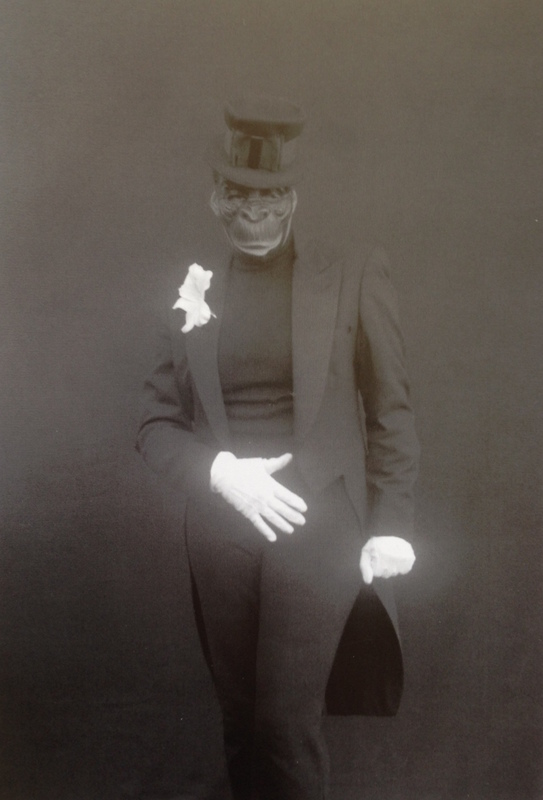 In the photograph, Weems, dressed in a suit wearing the gorilla mask, hides both her racial and sexual identity, highlighting the traditions of masking that take place during Mardi Gras. Though her costume alludes to the racist 1873 gorilla costume, Weems reverses both race and gender roles, by masking her identity as an African American woman and asserting the idea that she could be anyone under her costume. In Missing Link: Despair, Weems wears an all-black suit that comprises of long pants, a tuxedo jacket, and a turtleneck that meets the bottom of her mask. On top of the gorilla mask, she dons a black top-hat, recalling the peacock feather in the straw hat of Briton’s Gorilla costume design. The only shocks of color in the almost monotone image come from the white flower on Weems’ lapel and her glowing, white-gloved hands. The artist’s left hand, clenched in a fist at her side connotes power while her right hand covers her genitalia, as if to obscure the fact she is a woman. The placement of her right hand and its outstretched fingers, reminiscent of those of the banjo-strumming ape-like figure in the Comus Gorilla costume, also allude to the original 1873 image as does her contrapposto pose, similar to that of the gorilla swaying to the music. Weems’ Missing Link: Despair clearly references the racist undertones in the Gorilla costume design from the Missing Links Parade, but Weems’ photograph asserts a new, more gendered component on top of the older image of the gorilla. The photograph now draws upon not only deep racial discrimination in the history of Mardi Gras, but also the subjugated status of black women. Weems’ use of masking to hide and create identity also calls to mind the similar rituals the elite white men of the old Mardi Gras krewes practice to assert their place as the kings of Mardi Gras in order to enshrine their place at the top of the social and racial hierarchy of New Orleans. Missing Links: Despair, plays on both the racial and gender discrimination fundamental to the hierarchy of Mardi Gras, but Weems turns the tradition of masking in on itself: it is now the black woman who can direct her gaze at anyone while hiding her identity behind a mask.